Ruben Bemelmans just days after his shocking upset of No. 5 seed Stan Wawrinka. 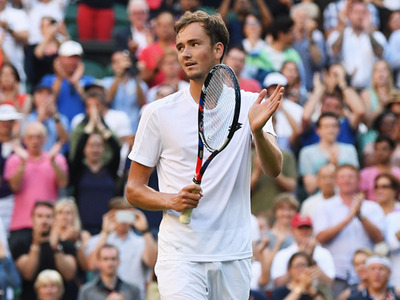 But while it was his play and composure that stood out in his first round match on Centre Court against one of the world’s best, in the second round it was Medvedev’s emotional meltdown that caught the attention of spectators. After losing to Ruben Bemelmans in five sets, both players went to shake hands with chair umpire Mariana Alves. Once Medvedev had gotten that courtesy out of the way, he opened his wallet and began tossing coins at the chair in a bizarre protest. Medvedev also assured reporters that he would personally apologise to the judge if he got the chance to. You can watch video of the interaction below. This is not the first time his career that Medvedev has found himself embroiled in controversy after being aggressive toward an umpire. At last year’s Savannah Challenger tournament, he was disqualified from the competition after making a racist comment at an umpire who gave a call to his opponent. Daniil Medvedev has just opened his wallet on court and thrown coins at the umpire’s chair.